Discussion in 'The Pub' started by ripple, Apr 25, 2016. I hate these assh*les with a passion, and thought we'd gotten rid of them last year after my epic Man vs. Bee offensive, but alas they must've saved the Queen and moved on to another unfortunate tree back in our woods. Anyway, I was out with the dog last night and came back to find this little fella buzzin' round the porchlight. Crunched like he was wearing a balsa wood suit once I got the welding glove out, though. Toughest bees I've ever had the displeasure of dealing with. Please allow me to be the first to say "Aaaaaaaaaaahhhhhh!!!" That is small compared to a few I have run into ( but still big enough to make most people run screaming like a schoolgirl). I feel your pain. We've got the Blackhawk size bumble bees and wasps in a bush out front. I've got the wife yelling in one ear about bumble bees being endangered and don't hurt them while trying to swat them away from my lazy cat. They mind their business for the most part but get riled up by the mower, etc. I usually get a wasp's nest around the house once or twice a year. Wait until dark and spray it down. All gone. Those little things sure can pack a wallop for something so small. 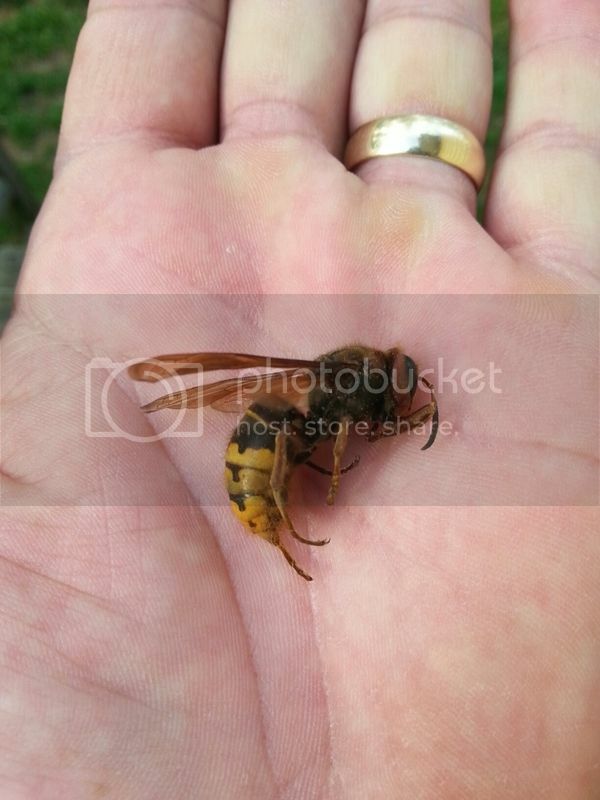 Judging by the size, that may be a Cicada Killer, which is a very docile member of the hornet/wasp family. 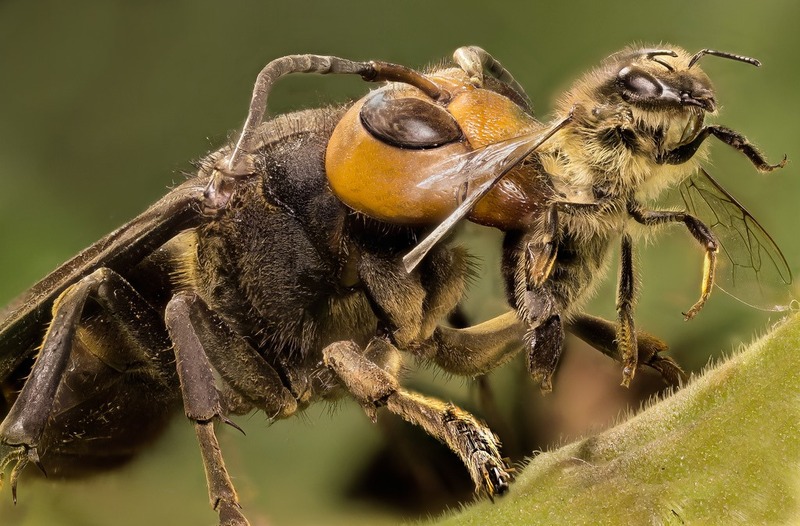 They look terrifying, but aren't aggressive, and their sting (which humans rarely experience) is far less painful than a yellow jacket, wasp or other hornet. Edit: After looking at the coloring, I believe zenmindbegginer's post below is correct. 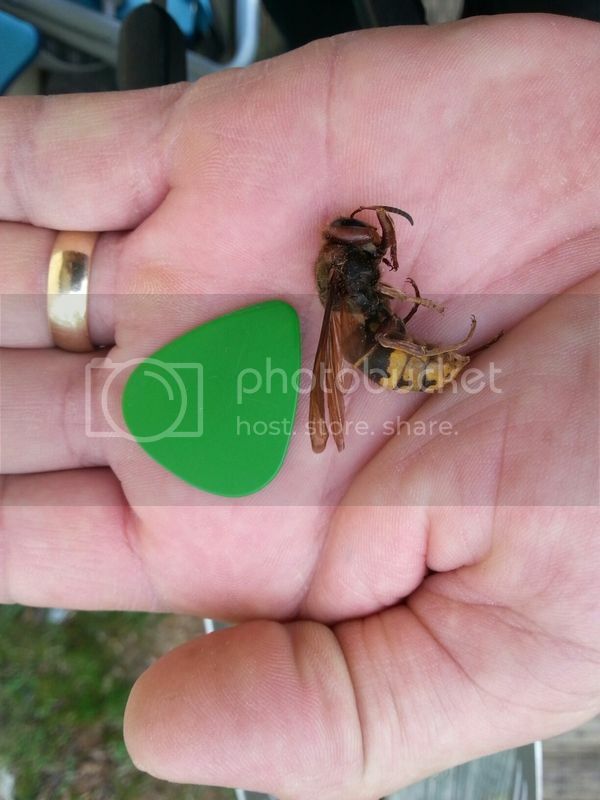 A European hornet matches the OP's images. Watch out if you get stung by a yellow jacket. They inject pheromones that make you attractive to other yellow jackets. Lasts ten days. Don't ask how I know. At least they are not Japanese Giant Hornets. An invasive species that we ran into when we lived in Atlanta. I didn't realize those were in the US now. Yikes! It's not a yellowjacket because it's got a lot of hair... it's a European hornet. Yellowjackets aren't attracted to light and the European hornet is. They are endangered because people confuse them with wasps and yellowjackets. You would have been fined up to 50,000 euros for destroying a European Hornet nest in Germany. They are voracious carnivores and eat a LOT of pests.